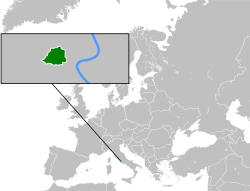 ^ "Vatican country profile". BBC News. 2018. Retrieved 24 August 2018. ^ Section, United Nations News Service (7 February 2017). "UN News - FEATURE: Diplomacy of the conscience – The Holy See at the United Nations". UN News Service Section. Retrieved 1 February 2018. 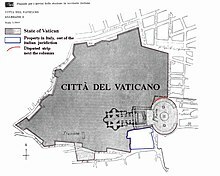 ^ "Why is Vatican City considered a country?". Quora. Retrieved 22 April 2018. 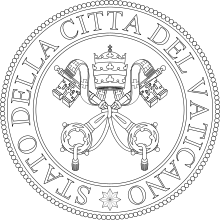 ^ a b "Vatican City drinks more wine per person than anywhere else in the world". The Independent. 25 February 2014. Retrieved 27 July 2018. ^ "Vatican crime rate 'soars'". 8 January 2003. Retrieved 6 March 2019. ^ Miller, Anne; Mitchinson, John (14 March 2013). "QI: some quite interesting facts about Popes". ISSN 0307-1235. Retrieved 6 March 2019. 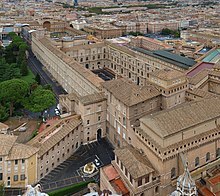 ^ "The Vatican Museums & St Peter's, Rome; gettting there -". www.rometoolkit.com. Retrieved 19 March 2018.